I wasn't sure whether to publish this picture or not. Some things must be forgotten forever and this is a delicate topic that shouldn't be publicized in any way, purposely or by chance. Fortunately I have another image that clearly acts as a counterpart to this one. Well, both of the images contain medals, medals of war that were some day on some soldier's chest who was very proud to represent his country and was sent to war on many occasions without really comprehend the meaning or the goal of such war. 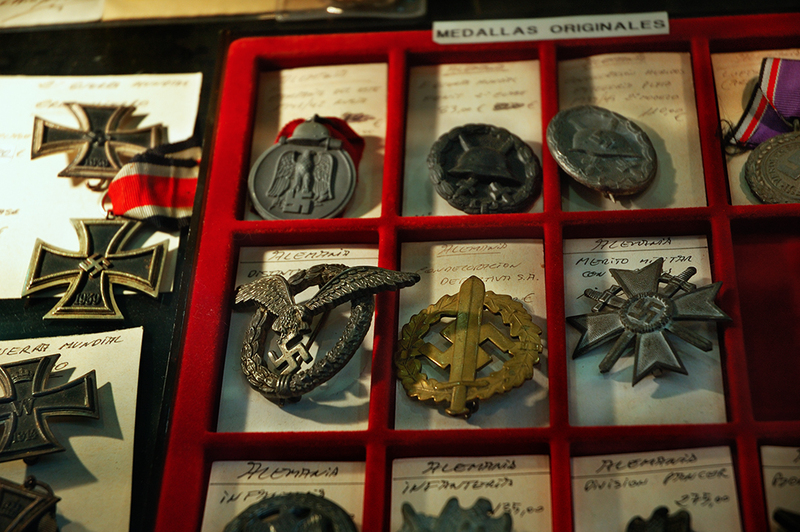 But when we talk about the holocaust (some medals here are older) there is no possible forgiveness regarding those who were represented by some medals here cause no national policy or belief can justify genocide. Once said that I just wanted to contrast these antique articles in a small shop in Barcelona with some other medals displayed representing USSR or the US. A wonderful shot. This needs to be remembered in honor of those who fought against it. They also serve as a harsh reminder of what cruelty we mush avoid.